Update, 4:35 p.m., Nov. 12: The story was updated with information about UM’s poll rankings and additional photos from the game against Notre Dame. 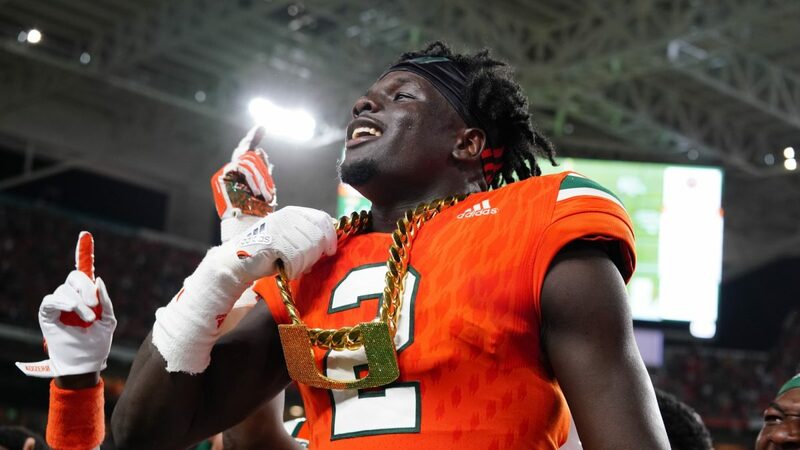 Just two weeks ago, much of the national media questioned if the Miami Hurricanes were legitimate contenders in college football. It’s safe to say that very few will be questioning them now. Led by a tenacious defense that seems to be getting better every week, No. 7 UM crushed the No. 3 Notre Dame Fighting Irish with a final score of 41-8 on Nov. 11 at Hard Rock Stadium. Miami remains undefeated and has moved up to No. 2 in the AP Top 25 poll. It is just behind Alabama, who beat Mississippi State 31-24 on Saturday. This is the highest UM football has been ranked since 2003, when it was also ranked No. 2. 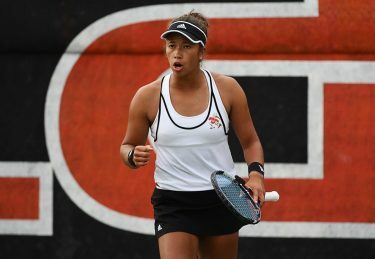 With Louisville defeating Virginia earlier in the evening, Miami (9-0, 6-0 ACC) officially clinched its first Coastal Division title in program history. The Hurricanes are set to play in their first ACC Championship Game Dec. 2 in Charlotte, North Carolina. This game was completely dominated by Miami’s defense, which totaled nine tackles for loss, five sacks and forced four interceptions. For nearly three quarters, UM didn’t let Notre Dame (8-2) score. Coming into the matchup, the Fighting Irish hadn’t scored fewer than 30 points since week two of the 2017 season. The Irish struggled so heavily that head coach Brian Kelly even took out starting quarterback Brandon Wimbush for part of the second quarter. He would return at the start of the second half. 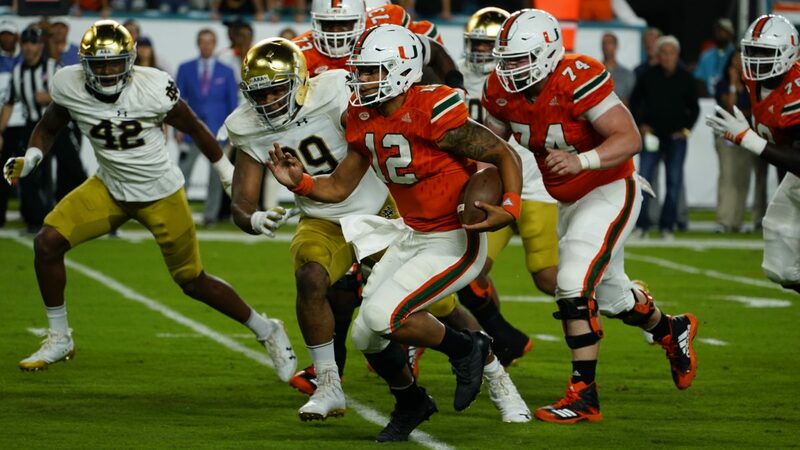 Hurricanes starting quarterback Malik Rosier was nothing spectacular, but he did arguably his best job managing the offense all season – making correct reads and choosing the right times to take off and run. Despite throwing for just 137 yards and one touchdown, he completed an efficient 63 percent of his throws. Rosier led the offense to 27 points in the red zone – an area where Miami has had difficulty for the majority of the season. Rosier added 44 rushing yards and a touchdown on nine carries. UM sophomore running back Travis Homer rushed for 146 yards on 18 carries, and freshman DeeJay Dallas had a breakout performance, running for 53 yards and two touchdowns on a career-high 12 carries. 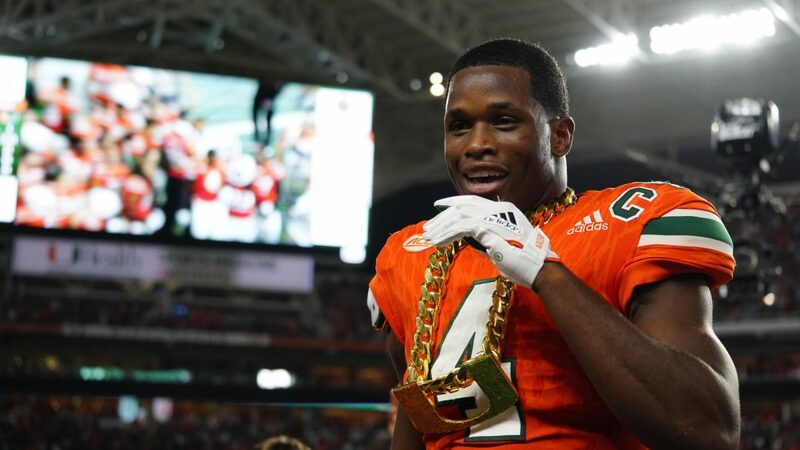 The Turnover Chain was out and about once again, and for the first time this season, one of the turnovers led to a defensive score. With 22 seconds left in the first half, freshman defensive back Trajan Bandy jumped the receiver route and intercepted Fighting Irish second-string quarterback Ian Book. Bandy returned the ball uncontested for 65 yards to complete the pick-six for the touchdown, giving the Hurricanes a 27-0 lead. Notre Dame, who had the No. 4-ranked rushing offense coming into the game, was ineffective on the ground. Junior running back Josh Adams came into the matchup ranked No. 9 in rushing yards with nearly 1200 yards along with nine touchdowns. On Saturday night, Miami held him to just 40 yards on 16 rushes. Adams wasn’t the only Fighting Irish player to struggle. Wimbush completed less than 50 percent of his passes and had one touchdown compared to three turnovers – two interceptions and a fumble lost. Miami will play its final home game of the season against Virginia as the Canes continue to strive for an undefeated season. Kickoff is set for a noon start Nov. 18 at Hard Rock Stadium. – The Hard Rock Stadium attendance totaled 65,303. 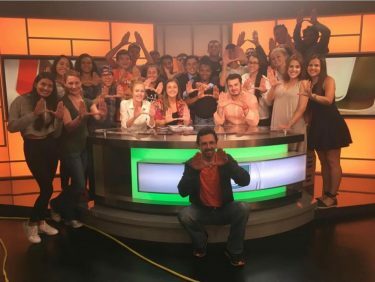 – Former UM safety Ed Reed and former Miami infielder and current Boston Red Sox manager Alex Cora were in attendance. – This is the 14th-straight win for the Hurricanes. Their last loss came to the Fighting Irish in last year’s 30-27 loss in South Bend, Indiana. – UM has forced the opposing team to commit four turnovers in four-straight games. – Notre Dame had turned over the ball just seven times coming into Saturday night. The Irish turned it over four times against Miami. – At one point, Miami scored twice in fewer than two minutes. – The Canes led 27-0 at halftime – their largest first-half advantage of 2017. – The Hurricanes scored 24 points off turnovers. – Redshirt freshman defensive end Jonathan Garvin has had a sack, forced a fumble and then recovered it in two consecutive games.